The main surf point at Arugam Bay is one of the best point breaks in the world. 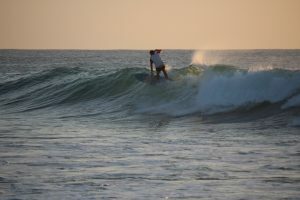 In season, Arugam Bay provides a consistent 2-5ft waves with long periods that range between 10-30 seconds. There is little tide to speak of and the wind is predominately offshore in the morning due to the south west monsoon. It breaks hollow on a part rocky outer reef and sand baby point from May through to September. The wave is a right and offers some great barrel surfing with lazy and fast sections which feel like they last a lifetime. We recommend that beginners use Baby Point (Arugam Bay), Pottuvil Point, Peanut Farm or Whiskey Point. You can hire a tuk tuk from Galaxy with a safe and reliable driver. We can recommend the best places to hire surfboards and good surf instructors.